Folding Carton Tooling | Jonco Die Company Inc. In 1897, the National Biscuit Company (Nabisco) became the first large company to adopt the new cartons, for Uneeda Biscuits. Other manufacturers soon followed. With inexpensive packaging, even common items could be placed in a showy carton and each carton became its own advertisement. The product was also protected, and the contents had a longer shelf life. This trend has continued with force through the 20th century. 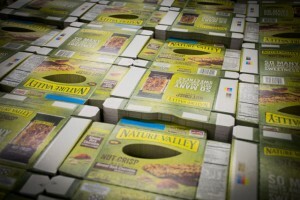 Folding cartons are now an eighty-billion dollar industry. Jonco Die Company Incorporated manufactures cutting dies, stripping systems, counter plates and blanking tools for converting paperboard into folding cartons.